designed to provide you with a unique experience. "The Radiant Viewer will do cross reference lines fairly easily. Plus it's light and super fast. I get a lot of calls from referring physicians about viewers that they can't get to work or aren't compatible with win7 or 64 bit and I always recommend the Radiant viewer. Haven't heard one complaint yet..."
Did you know? RadiAnt DICOM Viewer has been named researchers&apos; tool of choice in more than 500 scientific papers. Learn how to cite RadiAnt in academic publications. Do you know how frustrating it can be to endlessly wait for a patient CD to open? Does your viewer require the installation of additional components before the images can actually be viewed? 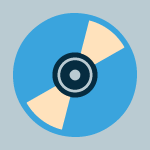 Try the RadiAnt DICOM Viewer CD/DVD autorun package! It is extremely fast, runs from CD/DVD media without installation on Windows XP SP3, Vista, Windows 7, Windows 8, Windows 8.1 and Windows 10 systems and does not have any additional software or programming requirements (e.g. .NET, Java). If the user’s operating system permits, the 64-bit version is opened for better efficiency. On older machines the 32-bit version is used. Approximately just 6MB of overhead data is added to the media. The logo image displayed after opening the application is fully customizable and can be used to show your company information to your clients. RadiAnt DICOM Viewer was designed to use resources as efficiently as possible. It can make use of a multiprocessor and multicore system with large amounts of gigabytes of RAM, but will also run on an old single-core machine with only 512MB RAM. A 64-bit version is provided for modern systems to keep all opened images in more than 4GB of memory, if necessary. Asynchronous reading lets you browse and process images while they are still being opened. All of this is available in one very compact application that has an installer size of just over 2MB. 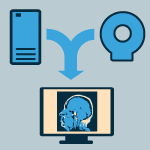 The PACS (Picture Archiving and Communication System) client feature lets RadiAnt DICOM Viewer query and retrieve studies from other PACS hosts. 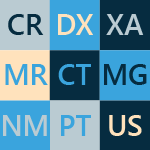 Supported service class users/providers are: C-ECHO SCU, C-ECHO SCP, C-FIND SCU, C-MOVE-SCU, C-STORE-SCP (Only transfers initiated from the RadiAnt DICOM Viewer are accepted. If you try to send studies from other PACS nodes without searching them first and starting the download in RadiAnt, they will be ignored). 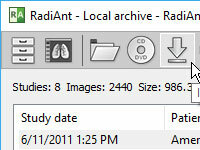 Received DICOM files are stored in a temporary folder and are deleted when RadiAnt closes. Multiple series of one study or several studies can be concurrently opened in the same or different windows for comparison purposes. Series consisting of images that have been acquired in the same plane (e.g. Computed Tomography series before and after administration of the contrast medium) are automatically synchronized by default. Cross-reference lines are displayed for better correlation of the anatomy when browsing series with different image planes (e.g. Magnetic Resonance study). 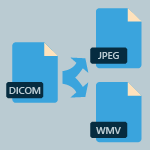 Create visually stunning presentations and professional publications - RadiAnt DICOM Viewer can export DICOM files to JPEG (compressed) or BMP (uncompressed bitmap) images and WMV (Windows Media Video) movies. One image, an entire series or all opened images can be exported simultaneously. Displayed images can be quickly copied to the Windows clipboard using the CTRL+C shortcut and can be quickly and easily pasted into Word or PowerPoint documents. 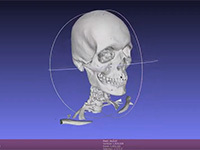 The MPR tool provided within RadiAnt DICOM Viewer can be used to reconstruct images in orthogonal planes (coronal, sagittal, axial or oblique, depending on what the base image plane is). 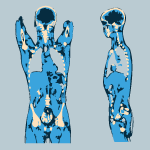 This can help to create a new perception of the anatomy that was not possible to visualize using the base images alone. The reconstruction process is extremely fast: a coronal series can be created from more than 2000 axial CT slices in approximately three seconds (on a modern Intel Core i7 system). The 3D VR (volume rendering) tool lets you visualize large volumes of data generated by modern CT/MR scanners in three dimensional space. The different aspects of the data set can be interactively explored in the 3D VR window. This tool lets you rotate the volume, change zoom level and position, adjust color and opacity, measure length and show hidden structures by cutting off the unwanted parts of the volume with the scalpel tool. The image is rendered progressively to maintain fluid operations even on slower machines. 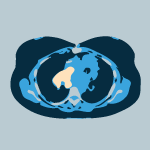 Overlay a color-mapped PET image onto a CT scan to obtain anatomical references for regions with increased FDG (fluorodeoxyglucose) uptake values. 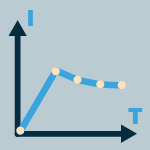 Use the ellipse tool to measure maximum, minimum and average values of SUVbw (Standardized Uptake Value calculated using body weight) in a specified area. 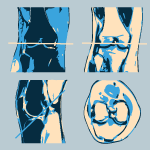 Image fusion can also be applied to other imaging modalities, such as Magnetic Resonance, e.g. DWI images can be fused with T1 or T2-weighted scans. RadiAnt DICOM Viewer lets you visualize the lesions' enhancement behavior (e.g. in Breast MRI) by plotting time-intensity curves (TICs). Different types of curves can be obtained: Ia - straight (the signal intensity continues to increase over the entire dynamic period) / Ib - curved (the time-signal intensity curve is flattened in the late postcontrast period), II - plateau (the signal intensity plateaus in the intermediate and late postcontrast periods) or III - washout (the signal intensity decreases (washes out) in the intermediate postcontrast period). Touch the image with one finger and move it to browse through images of the displayed series. To zoom in or out, touch two points on the image, and then move your fingers away from or toward each other. 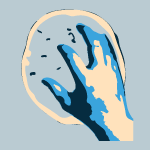 Drag the image with two fingers to move it and show invisible parts of zoomed image. 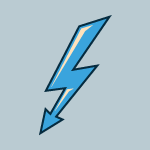 You can change the window settings (brightness/contrast) by touching the image with three fingers and moving them up/down (brightness) or left/right (contrast). 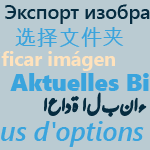 Arabic, Brazilian Portuguese, Bulgarian, Chinese, Czech, Danish, Dutch/Flemish, French, German, Greek, Hungarian, Indonesian, Italian, Polish, Portuguese, Russian, Serbian, Slovak, Spanish, Swedish, Turkish. 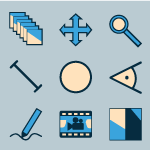 Our online tool makes it easy to edit the current translations and create new ones. It is not very often that studies comparing different DICOM viewers are published. 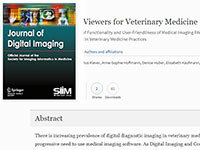 Recently, eight DICOM viewers were reviewed for use in veterinary medicine in the Journal of Digital Imaging. RadiAnt was named a favorite Windows DICOM-viewer of the observers. Overall it scored 8.90 points (the winning viewer for MacOS got 8.96). For your information, the reviewed version of RadiAnt was 3.4, so many new features and improvements have been added since. RadiAnt DICOM Viewer makes a cameo appearance ;-) in the ECR 2019 movie (European Congress of Radiology). 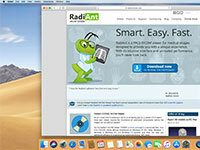 Today we uploaded a refreshed tutorial showing how to install RadiAnt on Mac computers. This video shows the installation process on the latest macOS Mojave systems. Disclaimer: RadiAnt DICOM Viewer is built and tested specifically for Windows platform. We do not officially support RadiAnt on platforms other than Windows. RadiAnt can technically run on macOS systems using the open-source Wine software, however, some features may not be available or may cause program crashes. Recently we have added the option to export 3D objects (e.g., for 3D printing) from the VR window to the STL files (click the arrow next to the Save button and select "Save 3D model as STL"). Try our latest BETA version here. Check this video showing how the 3D export feature works in RadiAnt. For the past few weeks we have been publishing beta versions with the local archive (DB) feature. It's still some time before a final realease is available but no major problems have been reported recently. 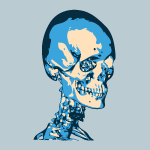 So, if storing DICOM studies in RadiAnt's database is something you've missed, you can go ahead and try our latest 4.9.15 BETA version here. And, since the end of the year is approaching fast, from all of us here at Medixant, happy holidays! Thanks for a great year and see you in 2019.